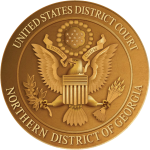 The Northern District of Georgia was established by Congress in 1849 and consists of forty-six counties (14,258 square miles) in the northwestern part of the state. The district, which includes the Atlanta metropolitan area, has four divisions: Atlanta, Gainesville, Newnan and Rome. The Rome division includes the following counties: Bartow, Catoosa, Chattooga, Dade, Floyd, Gordon, Murray, Paulding, Polk, Walker and Whitfield.